To some, holidays are for sleeping in. To others, holidays are for staying up. In our house, opinions are divided – the parents like to sleep in and the kids like to stay up. Yeah, you know what I mean. When we do convince them to catch some shut-eye we face a different problem: what sort of sleeping arrangements will allow us to rest without causing physical injury either to the vulnerable, young child or the adult who has to carry the luggage? Let me lay out the options as I see them, in roughly ascending order of age. Not sleeping is always a fallback, but let’s gloss over that for now. This is my least favourite option. For a start, many hotels will hire cots on request. Secondly, neither of our children – not even the one who sleeps pretty much anywhere – has ever really slept in a cot. We did buy a Kidco Travel Tent at one point, which I’m pleased to say has had a lot of use as a play tent, so it hasn’t been a complete waste. We’ve had no luck getting a child to sleep in it, though, and then there was that whole product recall/suffocation issue after which I was put off the whole travel tent idea (at least for babies) – not that it would have been a big concern for us because see above re: not ever sleeping in it. It came with us on one trip and has not been invited again. Update: Vilma from Free But Fun also suggests using your stroller’s port-cot attachment, if you have one. And expatlingo recommended the LittleLife Arc2 Travel Cot, which I haven’t tried. Then Jen at Here We Go Again goes the extra mile and gets her kids used to the travel cot before the holiday, although she can’t guarantee that does anything (but it’s definitely worth a try). You’ll know what you’re getting, and you won’t need to rely on anyone else to provide it. Provides over 85% of your daily exercise requirements in repeated bending, lifting and soothing. Bonus Tip: a sarong, pashmina or unfastened ring-sling across a porta-cot can make an insect-resistant cover and blackout shade. Those things don’t exactly fit in a carry-on-sized back pack. You have to fork out for a whole travel cot. That said, there’s a good chance you’ll find something only lightly-used in your local second hand market. Although if it’s easy to find lightly-used versions of things, it’s often because they’re next to useless. The Kidco Travel Tent – also handy as a pet tent. But not necessarily as a travel cot. We’ve never had any problems finding hotels which supply cots. It’s really common. The quality can vary, however (especially when it comes to safety standards in countries without stringent safety standards), and not all hotel staff are well trained in how to put them together. Side rails for toddlers are only occasionally available in our experience. You have to book a hotel which supplies them. You might be disappointed with what you get and/or have to take it apart in order to put it back together properly. The side rail: awkward to pack; rarely available to hire. HOTELS TAKE NOTE. Hold up your fingers to show how many times you think we’ve co-slept on holiday? Trick question – no-one has that many fingers. The eldest, in particular, has always needed a bit of extra comfort away from home, and we didn’t find it ruined his usual routine in the slightest (mind you, as mentioned, not much to ruin). We’ve always been able to get up and do our thing for a few hours once he’s asleep if we want to (and are physically able to keep our eyes open). Babies can sleep between parents, possibly on a change mat or bed nest (thanks Aunty Z for the very useful baby nest!). Older kids can share a double or large single bed with one parent – preferably using the side nearest the wall to prevent rolling out (but beware of entrapment between the bed and wall, especially with young babies). 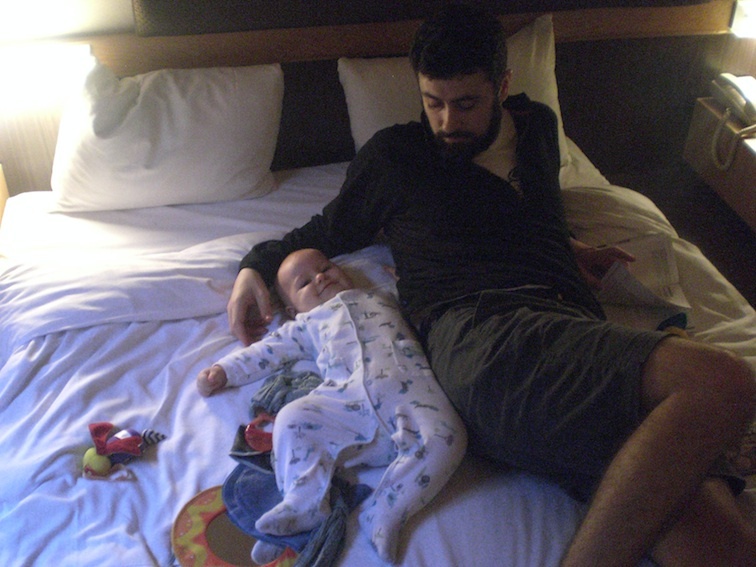 When T turned nearly-two years old, we started co-sleeping the children together on holidays – with the youngest next to the wall. These days, they often use either a double bed or two singles pushed together. No extra cots/bedding required (except for the optional snuggle nest). You might actually get some sleep. You need to be aware of advice on co-sleeping. Some people whose names start with A find it difficult to sleep in the same bed as children, especially wriggly children. At least one of them looks well rested. In some parts of the world – such as tatami-happy Japan – this is known simply as “sleeping”. If you’re holidaying in those parts, you need only book local-style accommodation and you’re good to go. 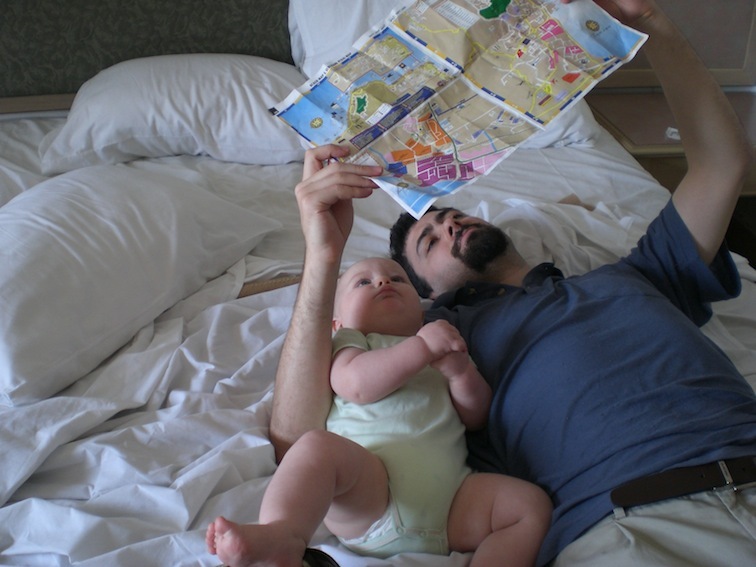 This was our tactic when we visited Taiwan with a ten-month-old, and we plan to use it again on our ski holiday to Japan early next year. In other parts of the world, you’ll need to either remove the mattress from the bed (and put it back before you have a run-in with housekeeping) or BYO camp mattress (ours are self-inflating so we don’t miss even the narrowest windows of settling opportunity). A couple of pieces of carefully-placed furniture can make a floor mattress into a de facto cot. Don’t ask me why our children sleep better on a de-facto-cot-camp-floor-mattress than in an actual cot, but they both do. We’ve used this tactic many times. Update: Bethaney from Flashpacker Family has recommended an inflatable toddler bed – an air mattress with pump and light sleeping bag cover which turns into a bag! She reports that it only takes five minutes with a foot pump to inflate (and the small amount of exercise probably – if anything – enhances the quality of your sleep). A hasty google also shows a model with side rails. Camp mattresses are much more packable than porta-cots. No big deal if they roll off (especially with tatami mats or very thin mattresses). (Our) children actually sleep this way, and so do (our) adults. If you’re going for a camp mattress, you still have to pack something, which is less convenient than hiring a hotel cot, assuming they’ll sleep in one. It’s not always convenient/desirable to put a mattress on the floor, and in any case, none of the above solutions protect against insects (except maybe the sarong-over-porta-cot one). Enter the bed tent. On our trip to Cambodia last year we packed our king-sized box net plus the poles from our two-person tent. Well-secured poles plus a firm tuck on all sides provides protection against both insects and accidentally rolling off onto the floor. Note that you probably won’t prevent rolling altogether – you’ll slow it down, preventing injury (sofartouchwood). If you don’t secure the poles well or tuck everything firmly you won’t have much protection at all. Both children co-slept together under the same bed tent. They either used a double bed or we pushed both singles together. For added protection against rolling accidents, we slept the youngest next to the wall, where available. Although I don’t have a photo of them that way around. In this picture, the net is secured to the room’s door. If it’s mainly mosquitoes you’re worried about, pop-up mosquito tents make life easier. I have less trust in these when it comes to roll-prevention, though, unless they’re securable and fully enclosed on the bottom, which many aren’t. You can see one in action at Zinc Sailing. After much deliberation, we’re looking into buying a two-person all-mesh (three seasons) tent for Christmas to add to our current two-person capacity so we can all camp out together in future (recommendations welcome). 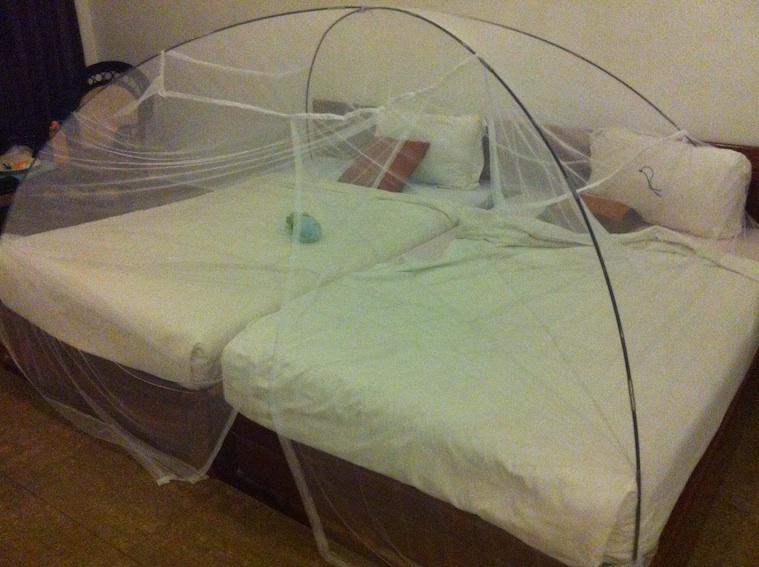 Once properly secured on top of a double bed, this should provide the best in both roll-accident and mosquito bite prevention. In a similar vein, Ali has a special safety-designed bed tent for her eight-year-old daughter, who has special needs, and recommends it. The bed tent is something we’ve used from around two years old up. I wouldn’t be comfortable using it for babies, except if co-sleeping with parents under the usual guidelines or if using a baby-specific product – otherwise I’d be worried about entrapment against the sides, and suffocation. Roll protection and insect protection. Not very suitable for infants, except under usual co-sleeping guidelines or using baby-specific product. Update (from A): if using your tent poles, it may ruin them slightly a bit. Two-person tent poles and king-sized box net over twin beds. Needs a tuck and tidy but close to being usable. I loved the extra ideas/experience/advice I got last time we had one of these discussions. If you can see anything I’ve missed here, let me know and I’ll update the post accordingly. And please share your experiences – it always fascinates me to hear of infants who sleep in actual infant beds. 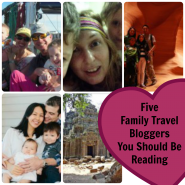 Read more tips for travelling with kids. 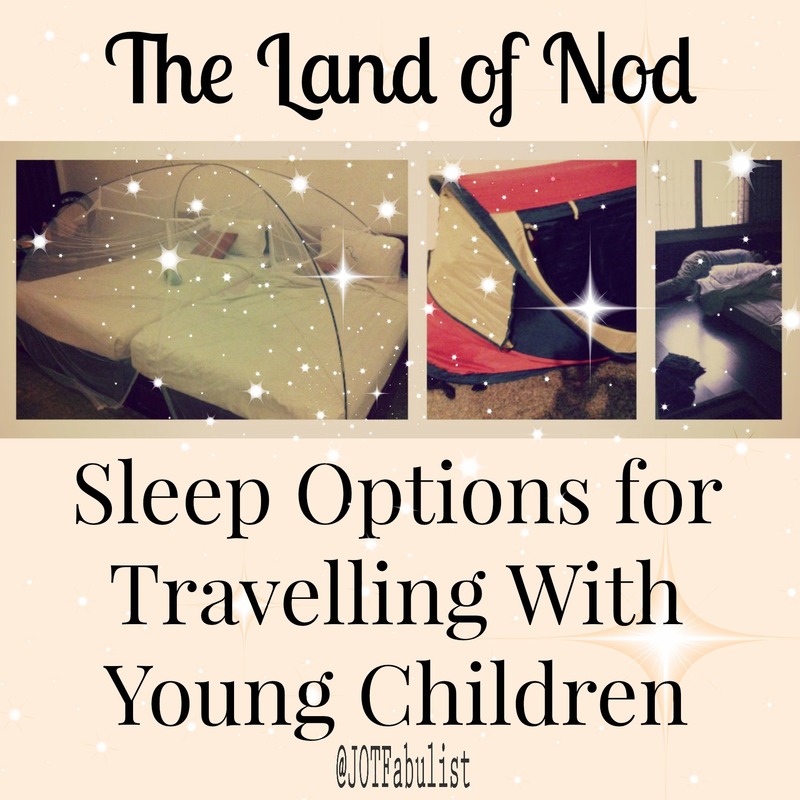 The post The Land of Nod: Sleep Options For Travelling With Young Children appeared first at Journeys of the Fabulist. Thanks for linking to us Bronwyn. I’ve commented before – this is a really useful article. But definitely benefited from that link, I think! Good luck with the holiday sleep over Easter. Of all the ways to sleep with kids, I think we’ve tried them all! It’s very nice to meet another traveling family and I have enjoyed getting to know you through your witty writings this morning. Looking forward to reading more in the future. Yes, I imagine you’ve got through all of them by now! In fact I feel quite chuffed to have covered them all without leaving you a few extras to note. It was great reading your blog today, too, and look forward to more! Great article. Our own kidco tent has been filled with plastic balls over the last few years and functioned as a ball pit – Our kids would never sleep in it. Great info. So far J (7 months) been in a hotel cot or the Brica foldn’go which worked well when he was tiny, but he had outgrown it by five months. As far as kids mats on the floor go – has anyone tried trunki’s nap mats? I am curious. I think that may be what we use when he gets a bit older. Do you mean the snooziheads? I thought they were more of a blanket and pillow rather than a mattress/similar. They look snazzy and they have some cool design features like the bit that keeps them “tucked in” in a sitting position but not quite grabbing me enough to buy one as opposed to using something we’ve already got. Unless there’s a different product I haven’t heard about? 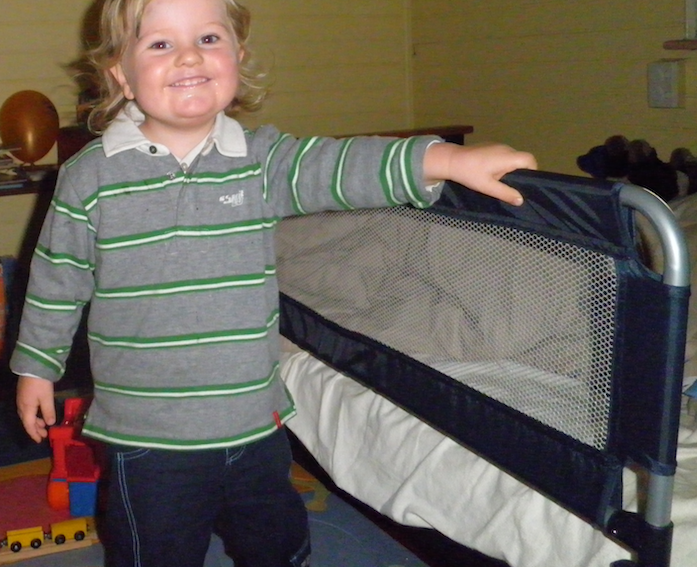 We bought an inflatable toddler bed just before we left Australia for SE Asia… best purchase ever!!! It’s saved us a tonne on accommodation and packs down so easily. Oh just looked. You mean like this one? That looks good. We’ve just used a normal single-sized air mattress (very thin and packable) which had the added bonus of we didn’t need to buy anything new, but the roll bars on the toddler version look good. I’ll add it to the post. BYO bedding is certainly a money-saver. Makes up its outlay pretty quickly. Ours came with a cover that is kind of like a light sleeping bag and then when you deflate it, you roll it up with the cover and the cover then becomes it’s own little carry bag. Very handy!!! That ones even lighter than the other one I hastily googled. Comes with a pump. One question: how does it go inflating it? Does it take long? Five minutes isn’t too bad. Important to know! Thanks. I would probably use a manual pump for five minutes rather than carry an extra kg *all the time* as well. Really good review! We have a travel cot, and both boys have slept in it. But I don’t think it would be practical if we travelled by airplane. It is big and heavy. We have had ok and teribble hired cots. We have done the floor sleeping, but we have not all coslept, since Daddy is not a fan of co-sleeping. 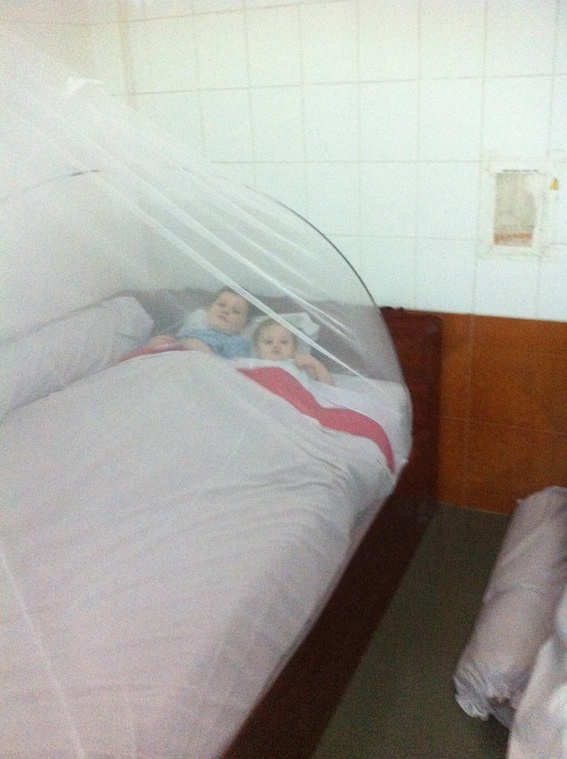 Here in Europe we don’t need bed tents, because usually there is a mosquito net on the window… (hopefully), and I have not travelled outside of Europe with kids yet…. I’ve seen a lot of airlines (bear in mind we’ve never having tried it) who are pretty good about allowing you to check your porta-cot. The rule is often that you’re allowed X number of “large baby items” per infant passenger (where items can be car seat, stroller, cot). You’d have to read the T&C well of course and maybe shop around a bit for your flight. And then you have to get a) to the check-in desk and b) from the luggage carousel – so that in itself puts me off – but it might not be as much of a deal breaker where it doesn’t count too badly towards your limit. Yay for mosquito nets on windows! They are the norm in Brisbane as well these days – DEFINITELY easier (although there’s still the rolling off to worry about). The floor sleeping does help there. We have the same Kidco tents which we occasionally use for the big boys, we’ve done the floor sleeping thing in Korea and at friends’ houses, brought our own pack & play (least favorite option), and had the baby sleep in the bassinet that comes with the pram (which worked until he could sit up). I don’t think co-sleeping would work for us since our boys are literally all.over.the.place. when they sleep. Great post, love all the options with pros and cons! Yeah, A’s not a big fan of co-sleeping. It doesn’t bother me but he’s a lighter sleeper. We try to put A on a single bed or mattress on the floor for co-sleeping nights 🙂 . Like you, we also tend to use a range of options depending on the exact circumstance. You really have to weigh it up on a case by case basis. Yes, I once read an article which said co-sleeping was the norm in Japan, until the kids are relatively old (true?). Yes, my friend co-slept with her son until he was 12 and that’s fairly standard!! He’s an only child though, which influences it. I’ve heard most boys don’t want to co-sleep once they start primary school at 6 and girls can be sooner. We’ve a couple of years to go yet to find out! Wow, twelve! I would have thought that yes, most children would start refusing. But six, hey? My 5.5yo still craves it, although he is ok with sharing his sister’s room these days and rarely crawls in at midnight any more (we still have to lie with him as he falls asleep and he sometimes requests that we stay all night though). I guess we will see, too! There are a lot of only children here and they tend to be older, but I just hope its true what they say that those with siblings are about 6. In our family too, its the boy that seems to crave the co-sleeping. My daughters do like it sometimes, but aren’t as “needy”. I don’t mind it as much as I thought I would. It means I get to have more sleep, yk!? Definitely whatever it takes for more sleep! We’ve never thought about bringing any sleep tent or portable cot with us on holidays. We always do the move of single beds, sofa beds and even sofas so that 2 adults and 2 kids can sleep. We even tried laying quilts on the floor for the kids. Now we have a baby, we’ve yet to try configuration of 5. Most likely he’ll sleep between us. Only kids are well-rested, I agree with you! Ah yes – another floor sleeper! It’s definitely a good tactic. Five is extra tricky, though – I’ve noticed a lot of rooms have a four-person limit. Actually it gets exponentially more tricky with each added person (three is also a lot easier than four). At some point I guess you get enough to book out a whole dorm in a hostel and then you’re ok again 😉 . Yes it gets more difficult with another baby. Baby needs much more space! I’m sure you can more than appreciate the logistics involved in getting kids to sleep *safely* and without too much excess equipment after your experiences with nieces and nephews! I think we tried just about everything when the boys were younger and now they doss in together. They are such cuddle bunnies with each other but would never admit it! We bought a port-a-bag when Max was a baby. I was good if you didn’t have to carry it so we use to take it to restaurants, pop him in it under the table and then take him out when we left. Defeats the propose but at least we got a meal in without the hip rocking! Oh, ok, I get the idea. Kind of similar in some ways to the stroller’s port-cot Free But Fun mentioned? So more for the baby (perhaps early toddler) age group? Although now you mention it a friend of ours had a zip-up baby swag with carry handles and they used it the same way so you could mean one of those. It was definitely for the infant age group and quite warm, too – they bought it because they are ski bunnies. Three kids later I daresay they got their money’s worth although I think they take a lot longer to save up for skiing now! We definitely utilize many of these options between our longer rentals (and sometimes even in a longer rental if it is a one-bedroom). We usually try to make separate beds on the floor if space is tight, but in the end co-sleeping usually wins out. We used the Kidco Travel Tents for a while and packed three when we drove the length of US Route 1 (we found a way to get them in our 10×10 tent along with two adult sleeping mats). However, now that we have all of our possession in our Mazda5 we only have sleeping bags and sleep sacks and make them work no matter what he sleeping arrangements.The net tent is an interesting idea that we never would have thought of; we’ll have to look into it! I’m impressed with your tents-within-a-tent efforts, but yes, I can see how they wouldn’t make the cut in a Mazda5 – especially against setting beds up on the floor. Funny how they have a way of worming themselves in with someone else, though 🙂 . With your kids a bit older and already having a sufficient tent plus adequate other sleeping arrangements to your names it’d be harder to justify I guess, but could be worth keeping in mind depending on where you’re travelling and what the insects are like there. Always good to know the full range of options in any case! You obviously have a pair like ours in that they are two very different types of sleepers. Just goes to show that for all the sleep advice in the world there’s no guaranteed formula. Oh, and I know exactly what you mean about kids who never, ever, ever admit to being tired! Excellent theme to a post, Bronwyn! Btw, the sleeping arrangements have not been a huge problem for us BUT sometimes getting kids to wind down in a new place takes a lot of effort. Any good advice on that? Ha! You know I often say if you want to learn how to do something you shouldn’t ask someone talented. Talented people don’t know *how* they do things, they just do them. They can’t explain it to anybody. No, if you want to learn you have to find someone untalented. And I am *very* untalented at getting children to wind down in an exciting, new place, so from that point of view you’ve asked the right person. Unfortunately, you need to find someone untalented *who’s eventually mastered the art* of whatever you’re interested in, and that’s where I fall down 😉 . The only techniques I have are a) stay in your time zone (not always going to work – especially for people like you with relatives on opposite sides of the earth! ); b) wear them out (I’m sure you try this every time as it is); and c) stop trying. Actually, I’ve found a lot of people underestimate the utility of giving up as a solution to the frustration of failing to solve a problem. We’ve actually cheated a few times when travelling within Finland/ by ferry and have been able to easily take two strollers: at bed time we’ve just popped them in their sleeping bags and gone for a walk… They love their sleeping bags, especially the winter ones, and I wonder if it is the closeness that makes them calm down? Btw, about the day sleeps outdoors, they’ve done research here to find that kids that slept outside during the days slept in the average a lot more and had better quality sleep than the ones who slept indoors (wonder what the results would be like over there in that climate?! Air con may be the one thing you really want?). I don’t know about sleeping more or better but as our son was very poor day sleeper (20-30min in one go, which wasn’t enough for him), it was pretty easy to “teach” him to sleep longer, just push the stroller a bit. That’s interesting research. I wonder what element of the outdoors makes it so? The gentle background noises? The temperature? The fresh air? Millions of parents want to know! I have noticed that my guys sleep better in cooler climates and I think it’s part sleep physiology (body needs to be at the right temperature to sleep) and part the snuggliness of sleeping bags and blankets. The air con doesn’t seem to have the same effect, for some reason. P was the same with day sleeping, only he hated sleeping in the stroller as much as he hated the cot (although he was better as a toddler). Im guessing it is the combination of all those, fresh air, temperature, background noice, sleeping bags etc but haven’t seen research able to point out what it really is! Researchers! Take note! Clearly from the discussion here we are all dying to know the secret formula! Well, I’ve been happy enough with the bed tent, especially in mozzie territory. As I recall though they co slept with us perhaps half the nights in Cambodia. In Bangalore, when they were a year older, they were fine in their own bed. The unusual bed settings has put a fair bit of wear on the tent, too – some of the poles are starting to fracture. It has done good service though, 15 years or so. Yes, there were quite a few nights we co-slept with them under the bed tents, now you mention it. They did do a bit of sibling co-sleeping but they weren’t consistent about it until more recently. I’ve added a note about the wear and tear on the tent poles as that’s certainly true (although so’s the bit about them being 15yo tent poles). 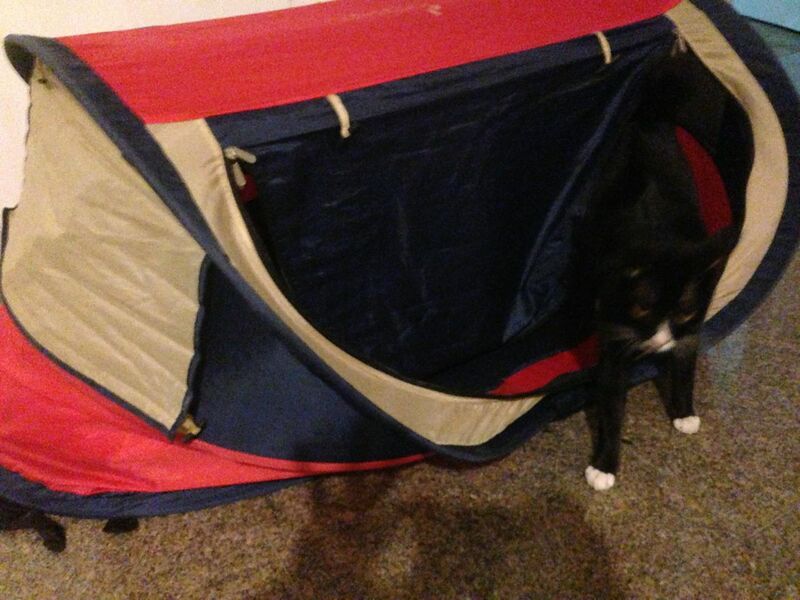 I’ve never even heard about the tent beds before. Good to know if there is a need in the future! We haven’t travelled anywhere where mossies would be a problem now. Our both kids have actually as babies slept in travel cots just as well- or poorly- as they have at home. We also have one with a “door” at one end they could crawl in and out of, so in hotels they have even liked to play in the “tunnel”. But i do find it a hasske to carry it if there is another option. We’ve also had them sleep in the portable cot of the pram when they’ve been babies (I think we have slightly different ones here to use than in other countries, bigger, as our toddlers nap outdoors in the prams often until about 2yrs old. Yes, even in the winter 🙂 ). Since mr V was about 1, 5 yrs they have coslept on a sigle madras (heads in different ends), when eg visiting friend. They like it and i like it as no harm is done if they roll out – their are no bugs here. But our preferable option is also two double / queen size beds. We may tuck extra pillows under the edge of the madras if kids can’t sleep next to the wall. But our kids have slept in normal beds since they were about 1 so I guess the need of special arrangements has been slim. The bed tents are really good for areas where mosquitoes can be a danger – like a lot of countries near us! Wow, outdoor sleeping in winter – keen! And normal beds since one? With roll bars or just plain normal beds? Both ours would roll off anything until… well, actually I’ve been trying to remember because T I still don’t trust. I think it was at least 3.5 if not 4yo with P? The ports-cot from pram one is definitely worth mentioning. Yours do sound bigger, and we never had a porta-cot thing for our stroller anyway, but we did use the infant capsule once or twice at friend’s houses, which is similar (if not as ideal). We had a normal bed for Miss A ready as we decided we wouldn’t buy a 2nd cot for Mr V, and as their age difference is so small the plan was for him to sleep in the famous maternity cardboard box for the first 2-3 months, and then try to move them both “up” to the next bed. We figured it’s not worth having 2 cots for a few months. But we ended up putting A in the normal bed earlier than planned as she went through a phase where she severly fought the sleep, and clinged on to the bars of the cot for her dear life in order to not fall a sleep. We just figured we might try not to have bars to cling on to, and it worked! She was able to calm down in her junior bed much better. Initially we had a madress on the floor next to the bed, stuffed pillows under the edge of the madras where the side bars ended (in the middle their is no bars but at both ends there is a short side bar) and she has fallen down a couple fo times but she has never woken up to it. I think kids go so limb when they sleep that they fall very softly. Also, her junior bed was a bit lower than quite normal adult beds. Mr V sleeps in that bed now (Miss A has has been upgraded to an upper bunk, so now she has proper side bars and latter), and he was moved to it he slept SOOOOO restlessly when he was 1 yr and 3-4months. On my mums suggestion we first took the side of the cot (with a madrass on the floor next to), and that helped so we tried the bed which is wider, and the nights got a lot better immediately. He must have been waking himself up slamming feet and hands agains the sides? He often sleeps diagonally across the bed, so a round bed might be the best option for him 🙂 But even though he is a restless sleeper (not ideal to cosleep with…) I can’t remember him falling from the bed at all. Obviously there has been phases where the evening bed time requires a guard at the door… but it hasn’t been too bad. Definitely not worth having a cot for just a few months. I think you’re right about banging against the cot bars – at a guess (who knows sometimes with babies) this seemed to be our problem, too. One night I put P to sleep on the (double) sofa bed out of sheer frustration and exhaustion and to my surprise for the first time he slept through *by himself*! After experimenting further it seemed something about the cot was disturbing his sleep and then I kicked myself because OMG, so many sleepless nights for so long and *that* was what solved it? How many sleep books did I read and nobody told me to try that?? But what were we talking about? Oh yes. Your guys seem good with the rolling out of bed. We also had a mattress next to the sofa bed (it was low, too, like your toddler bed) but after the first six times P woke himself by rolling off in the middle of the night we got a mesh guard rail – and he was two, so older than your guys. Come to think of it, he probably still woke up when he hit the mesh guard rail, but it didn’t wake him so shockingly so he was easier to resettle and with a whole double bed it didn’t happen nearly so often! I’m definitely inclined to blame active sleep + bumps in the night for a lot of his poor sleep habits. Your guys must have been very heavily asleep when they rolled to not wake up to it! Our kids have pretty much always been good with their evening sleep in the way that we have been able to move them then (countless times coming home in the evening and carrying them upstairs from the car). Maybe it has helped that even in our deepest coma phase we never tiptoed around them (apart from when they were just falling asleep, of course) and moved them when needed even when they were asleep (getting countless on comments on how one should not disturb a sleeping baby… )? The problem in our house has rather been that if they do wake up, and they used to frequently, they never went back to sleep in less than 2 hours. So on “good” nights you were first up with one for 2hours, then with the other one, then swaping again, and at 5.30am one decided to get up. Yay Still have no solution for that but time. But sounds like P really is a restless sleeper! Is it still as bad? I really think for all the things people tell you to do/say will help in the long run time is the biggest thing. It’s my theory that we are hard-wired to get unsettled in the face of stealth. Even with a light sleeper it was best not to try too hard. A tiptoe would wake him more easily than normal walking – although crashing around was out of the question. We never could get the moving-when-asleep thing going, though, with P (even now). T we can move wherever. Good to hear he sleeps better now! I have to agree, I believe time is the best solution too, and lately our nights have gotten so much better. I think your experience, like mine, shows though, how different kids are! When my kids were babies, they’d just co-sleep with us. When they got slightly bigger we heavily, heavily used a travel tent bed (a more sturdy variety than the one pictured in your post; it sets up more like a traditional tent: http://www.amazon.co.uk/Lifemarque-L10272-LittleLife-Arc-2-Travel/dp/B000UNKO2G). Both of my kids slept anywhere in that tent. It also gave me piece of mind knowing that they weren’t going to get out of bed and fall down stairs, etc in other people’s house. Also, I’ve been offered some really, really crummy cots by hotels in the past. Ones that were very unsafe, so I felt better having my little easy-to-pack tent. That one does look better (also cheaper…). At what age did they stop using it? My youngest can still use it and he’s 2.5; it’s still long enough to comfortably fit. Hm. I’m thinking at this stage it’d be best to push ahead with the 2-person tent, which should at least get use as a tent. If I’d bought it several years back I might have got my use out of it. Then again, since they are allergic to all forms of separated sleeping, perhaps not – we’ll never know. I do like the way it looks firm, yet not so enclosed. Looks as though it would allow better air-flow than the one I bought. These are great! Z slept in our bed until she was about 2 and then she actually started sleeping in a port-o-crib for toddlers. I was really surprised that she would do that, but the crib had a little zipper door on the end, so she could get out if she woke up and join us in our bed. Now, she sleeps on a twin mattress on the floor. All in our room though, I haven’t quite been ready to move her to her own room yet. Yes, ours are in a room with us unless we have an apartment/cabin with more than one room inside the same unit. Don’t like the idea of them being down the hall just yet! It can make it hard to find accommodation sometimes, although if we can find two double beds in a room we’re good. Loved this post – how I remember the “cot struggles.” Co-sleeping all the way – why make life harder! People have reasons (A, who may have a mild form of claustrophobia, will tell you about his co-sleeping-induced nightmares one day) and there is a safety debate (although at a certain point the risk of SIDS becomes vastly outweighed by the risk of sleep-deprived parental throttling and/or dangerous absent-mindedness, so you have to weigh these things carefully). To be honest, when I said we tried to get “them” to sleep in a cot, I was mainly talking about the eldest. The second time around we gave up more or less immediately. Pushing their sleep habits when travelling? Ha! We are more or less on the same page here.